Due to the top design of the silver print head cartridge on early versions of the Developer's Kit printer, there is a possibility for the silver print head to stop dispensing silver (even though there may be sufficient pressure from the pneumatics tank and the silver is loaded properly). Silver will not dispense; despite there being sufficient air pressure, no problems with the pneumatics system, or silver properly loaded, and no clogged red silver dispense is present. When issuing a M42 P45 command, then Developer's Kit Printer will not respond to opening and closing the solenoid valve (see Picture 000-A, B). There will be no "piff" dispense sound of opening or closing the valve either. M42 P45 S255 opens the solenoid and M42 P45 S0 closes it. NOTE: When the solenoid is opened and closed, there is a red light on the top of the unit that may be visible in dark ambient lighting conditions. Picture 000 A, B: Sending gcode to open/close the solenoid on the Developer's Kit silver print head. Cause #1 - The connector to the solenoid that controls the opening and closing to release silver from the nozzle in the silver print head cartridge has become unseated. This could either be from the top (which is obvious), or down below inside the cartridge (which is more challenging to spot). The problem occurs outside of the pneumatics tank and electronic regulator in the system. It focuses specially on the solenoid contained deep within the silver print head itself. This connector can become unseated from its connector inside of the silver cartridge (see Picture 001). When this happens within the print head it is hard to discover. Picture 001: The power connector to the solenoid for the silver print head has become disconnected. Cause #2 - It is also possible for the silver print head top connector to become unseated (see Picture 002a). This is easier to diagnosis and fix. This version of issue does not involve removing the cartridge cover (see Picture 003). The top connector just needs to be reseated by pressing it in (Picture 002b). Picture 002a: The top solenoid connector has become disconnected from the machine and and is not providing power. Picture 002b: The top power connector to the silver print head solenoid is inserted properly here. However, the lower portion could potentially be unseated if silver is not printing. The solution to this problem simply involves disassembling the silver print head cartridge and reseating the unplugged connector to the solenoid which is likely unplugged and free. Below are the simple steps to solve it. 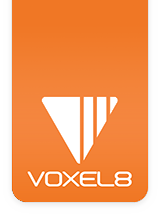 NOTE: If you are not mechanically inclined, or do not posses the correct star point screwdriver to remove the silver cartridge holder, then contact support and ask to have your silver print head sent in to Voxel8n and repaired. 1. For this repair, you will need to fully remove the silver print head (see Picture 003). Picture 003: The silver print head removed from the Voxel8 Developer's Kit Printer and ready for repair. You will need to disconnect the pneumatic tube that plugs into the manifold on the Core XY carriage (see Picture 004). This is done by depressing the white o-ring around the tube and pulling up on the tube. Picture 004: The silver print head has been removed from the Voxel8 Developer's Kit Printer. 2. Locate a starpoint driver for the three screws that hold the silver print head cartridge holder together (see Picture 005). Picture 005: Ready to remove the screws. 3. Locate the three screws on the bottom of the silver print head (see Picture 006). Picture 006: The three screws to remove on the bottom of the silver print head. 4. Remove the three screws (see Picture 007). Picture 007: Removing the screws using the starpoint. 5. The first screw is undone (see Picture 008). Picture 008: Removed the first screw and keep it in a visible place. 6. After the three screws have been removed, carefully remove the internal components from the silver print head cartridge (see Picture 009). Picture 009: All three of the screws have been removed from the silver print head cartridge. 7. Pull apart the silver print head cartridge so the components are visible inside (see Picture 010). Picture 010: The silver print head cartridge has been carefully removed to expose the guts of the print head. 8. The connector has been partially connected here causing the solenoid to stop working and not dispense any silver (see Picture 011). Picture 001: The power connector here is only partially disconnected, but is still an issue. 9. Plug the power connector back in and make sure it is firmly secured (see Picture 012). Picture 012: Reinserting the power connector to the solenoid. 10. The power to the solenoid is now reconnected to the bottom connector (see Picture 013). Picture 013: Power connector is plugged in again. 11. Double check the solenoid power connector before beginning to reassemble the silver print head and sliding the cover back on the unit (see Picture 014). Picture 014: The silver print head is ready to be reassembled. 12. Reassemble the silver print head with the removed three screws (see Picture 015). The print head cartridge should be well seated with no visible gaps, and the screws should be fully inserted. Picture 015: The silver print head reassembled. 13. Reinsert the silver print head into the Voxel8 Developer's Kit printer. Reattach the clear pneumatics tube back into the manifold located on the Core XY carriage (see Picture 016). Picture 016: The silver print head has been reassembled, loaded with silver, and ready to print. 14. Test the repair done by running a new alignment, and examining for proper silver dispensing.